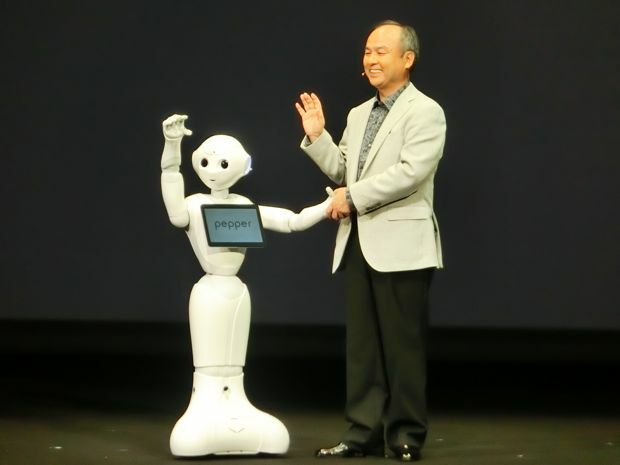 Japanese telecom Softbank and its CEO Masayoshi Son have never been afraid to push the envelope, and now the exec is presenting a new development: robots. Presented at a press conference earlier today in Japan (take a peek at the live video stream embedded after the break) it's called Pepper, and uses technology acquired from the French robotics company Aldebaran. Those are the folks behind the Nao humanoid robots we've been covering for years, from their first steps to the inevitable dance-offs that followed. Aldebaran CEO Bruno Maisonnier credited Son for believing in its vision, saying robots that can recognize human emotion will change the way we live and communicate -- and this is a big step towards getting bots into daily lives, at least if you live in Japan. The robots will debut at two stores tomorrow in their customer service capacity, but Softbank is planning to put them on sale to the public next year, priced just shy of $2,000. Pepper can communicate through emotion, speech or body language and it's equipped with both mics and proximity sensors. Inside, it will be possible to install apps and upgrade the unit's functionality, the plan being to make Pepper far more smarter than when you first bought it. It already understands 4,500 Japanese words, but perhaps more impressively, Pepper can apparently read into the tone used to understand its master's disposition. Maisonnier claims this will be the start of a robot revolution that rivals the rollout of the PC and smartphone. According to him "With Pepper, the future begins today."